A young cancer patient who captured the heart of her community in Chicago's Mt. Greenwood neighborhood has died. CHICAGO, IL -- A young cancer patient who captured the heart of her community in Chicago's Mt. Greenwood neighborhood has died. Last month, Emily Beazley, 12, had a street named after her, got a call from idol Taylor Swift, and was named an honorary police officer with her little sister, Olivia. Emily's mother, Nadia, posted on her Facebook page that Emily died at 11:02 p.m. Monday, "My beautiful Emily got to use her angel wings. She fought hard to the end. Her last gift to me was passing peacefully." Four years ago, Emily was diagnosed with non-Hodgkin lymphoma. She'd gone into remission but the cancer returned. Her sister donated stem cells to try to help save Emily's life. 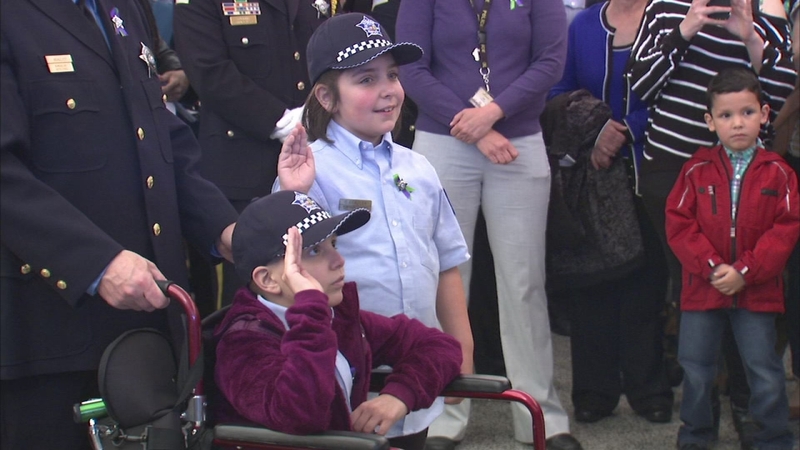 For their bravery, the two girls, who come from a family of Chicago police officers, became honorary cops last month. Mt. Greenwood neighbors strung ribbons of green and purple -- the colors that represent non-Hodgkin lymphoma-- around their trees and lit up their homes and businesses in the same colors in a social media campaign called "Light It Up for Emily." Eventually, even the Willis Tower and Soldier Field were illuminated in "Emily's colors." "Emily Beazley and the Beazley family were able to raise more awareness than I think a lot of us have ever seen about this illness," Dr. Jason Canner, Advocate Children's Hospital, said. Dr. Canner was one of the doctors on Emily's team. Calling her a brave girl, he said Emily remains a presence in the fight against pediatric cancer. "Emily wants a cure for this disease and I can tell you the Beazley family is not going to stop until we reach that goal," he said. Perhaps Emily summed it up best when she spoke after becoming an honorary police officer. Chicago has two new police officers -- and these rookies are young. Emily Beazley, 12, and her younger sister, Olivia, were sworn in on Tuesday.